More wireless music – ..:: NJ Brideau ::..
A new toy arrived in the mail the other day, the very recently released chromecast audio from Google. Long-time readers of this site may remember when I bought and set up my Raspberry Pi, but my tastes changed (or the software stopped working well) in the past year and my $35 computer is unfortunately just collecting dust. We listen to a lot of internet radio here in The Horseshoe, most of it through the 3.5mm jack of our phones plugged in to the back of the stereo. For the most part we have been getting along fine, however it does mean that one person has to leave their phone in the other room. This also means that phone burns battery and whenever a new message comes through the music is interrupted. And if we happen to be relaxing in the lounge, then whoever has their phone plugged in has to deal with the audio cable sticking out of it. 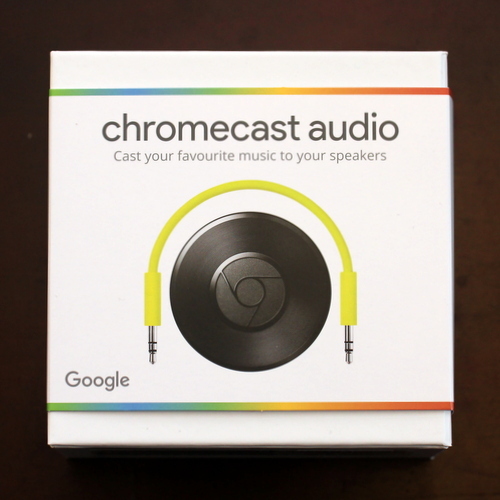 Therefore, when Google announced the chromecast audio, I thought we would be the perfect customers. To give you an idea of size, the upgrade has gone small. Here is the little puck next to a quarter. [This is actually 5 Icelandic Króna, but I couldn’t find a US quarter, and this feels like the same size.] The device itself is pretty small, and has two ports built in. One is for power, for which Google supplies a standard micro USB adapter and cable, and the other is for audio. The audio port looks like a digital 3.5mm audio port found in some laptops and old portables. I originally plugged in a normal 3.5mm cable and it worked fine, but upgraded to a mini-to-standard Toslink optical cable, which I find to have even better audio fidelity. Pictured below is my set up, I have it resting on top of my receiver, but could easily hide it behind. So what is it like to use? In short, solid. I plugged it in, downloaded the chromecast app to my phone, and within a couple of clicks had it set up and running on my home wifi. How does it work? Basically it connects to your wireless network, and then you can “cast” what you want to listen to to the device. Below is an example with Google Play Music. Once I find the song I want, I just have to click the box with a wifi symbol (in the panther nose) and select my device. 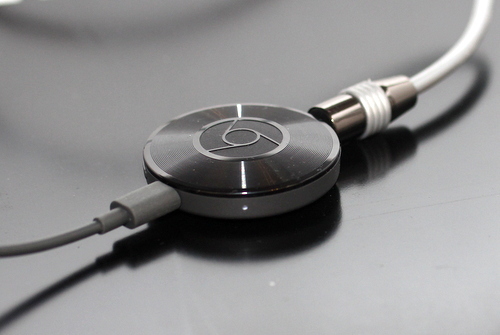 This works great for me because almost all of my music sources are compatible with my chromecast. I mostly use Google Play Music for my own library, but also Soundcloud and Podcast Addict for my weekly DJ sets and podcasts. Spotify is supposed to work, but since I am not a premium member I cannot use this feature. One main drawback is limited YouTube capabilities. The built in cast feature in the app is only available if I go to my phone/tablet drop down menu and enable “cast screen”. This allows the audio to be sent to my chromcast audio, but at 1/10th of the volume if it were through the native apps above. 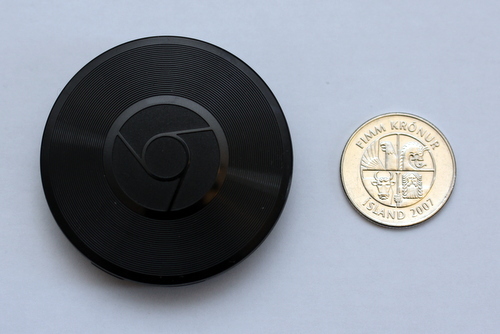 The same is true if I use the chromecast extension in the chrome browser on my laptop. Maybe this will be fixes, but maybe not, as I bet the YouTube support is in the video version, chromecast 2. The best feature and biggest benefit for me is that the device uses the web to find the content. 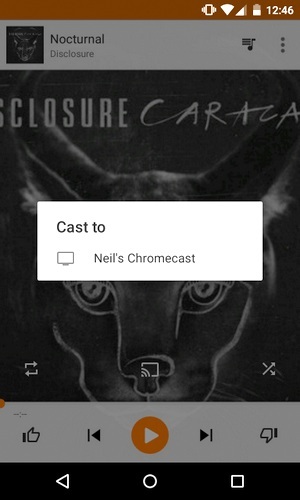 This means that you initialize the stream through your phone, then the chromecast does the rest and pulls the stream itself, freeing up your phone (and your phone’s battery) again. I can set an album to play, cast it to my device, and then go back to using my phone however I want. This includes messaging, browsing the web, watching videos, you get the idea. Then should I want to skip songs or pause, I can go back to my app and it does so with very little lag time. I have yet to test this with iOS users, and guests who aren’t linked to my home network, but this will happen with time. In conclusion, this is a nice little gadget to add to my collection, and one that I think I will use a lot.